Perhaps you've heard a phrase, such as 'Sic Itur Ad Astra'. . .
Return of visible suborbital launches! Wallops Flight Facility is undergoing some changes with the advent of Commercial Space Launches. All the while remaining as historic Wallops Island, Virginia. The Great American Eclipse site has some of the best information on this spectacle of Nature. It cannot be overstated that you risk damaging your eyesight during the partial phases. Image page of circumstances of this eclipse by Dr. F. Espenak. I have created a KML file of the Two minute 40 second path - The maximum time this eclipse offers. Located in the far corner of Big Oak Park - follow the road to the silver dome! USNO's The Astronomical Almanac Online! Are you fascinated by meteorite craters? Come enjoy, and share Earth's violent history. NASA's Launch Schedule features the planned dates and details for missions by NASA and the partner nations in the International Space Station Program, including Russia, European Space Agency and Japan. To learn more about how the schedule is arranged and what it includes, check out Launch Schedule 101. Get your NASA TV fix here. @StargazerUSA On Saturday night, September 19 around 7:50 p.m. EDT, it looked like a passing comet or a giant, luminous amoeba. But this was pure rocket science. Courtesy of Wallops Island Flight Facility, in Virginia. 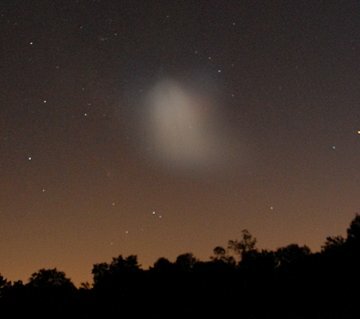 The cloud was created by a Black Brant XII sounding rocket. "Comets and Life On Earth"
It is becoming a bit more clear how life may have originated on Earth. On launch day, a blog will update the countdown beginning at 4 p.m. Originating from Kennedy, the blog is the definitive Internet source for information leading up to launch. During the mission, visitors to NASA's shuttle Web site can read about the crew's progress and watch the spacewalks live. As Discovery's flight wraps up, NASA's blog will detail the spacecraft's return to Earth. The International Occultation Timing Association (IOTA) has just released a new book on Occultations. It's a free, online and ready for downloading PDF file. It is 388 Pages. If you like to time the disappearance of stars (and asteroids, planets. . . ) and reappearances along the lunar limb, you will find this manual to be a great resource. "The International Occultation Timing Association (IOTA) wants you for the most exciting observations you can make – occultations ! Never before has there been an opportunity to contribute to the body of scientific knowledge about the lunar limb profile and the size of shape of asteroids plus a host of other occultation phenomena. . ."
"Occultations occur when one celestial body passes in front of another, temporarily blocking its light. The observation of these "eclipse" events provides important information on the celestial body responsible for the eclipse. . ."
"All astronomers, both amateur and professional, can make occultation observations.This book has all the necessary information one needs to begin a successful occultation program. Whether you are a novice observer, or an advanced observer with a video system, you can assist in the search for asteroidal moons, help discover new double stars and help determine the size of the Sun during solar eclipses. . ."
"Written by IOTA's most experienced astronomers, this is the only book you'll need for occultation observations of stars by the Moon, by asteroids, and other solar system bodies. It includes an extensive set of Appendices, and over 120 figures and diagrams, 388 pages. - is currently online, FREE as an e-book. . ."
Thanks go out to the AOS for the link!